This looks like an interesting new blog which apparently kicks off today. US Tech Sergeants Ken Raimondi and Nathan Gallaghan are going to travel through five regional commands in Afghanistan blogging and vlogging along the way. "We want to show you what life is like out there, not just for service members, but for the Afghans we’re all here to free from the grip of war. From past experience, I can tell you the lives of people here are hard. Sleeping in small rooms packed to the ceiling with cots and bunk beds with platoons of soldiers who haven’t showered in a week. "But they’re here for a reason; they’re working for a greater good. A greater good I feel isn’t covered enough in the mass media. I want to answer the question, why are we doing this? Why are service members and civilians out there being killed, wounded and suffering miserable lives? And I want to cover it from an “average” perspective, talking about it in normal speak so everyone can see this war as those on the ground see it." 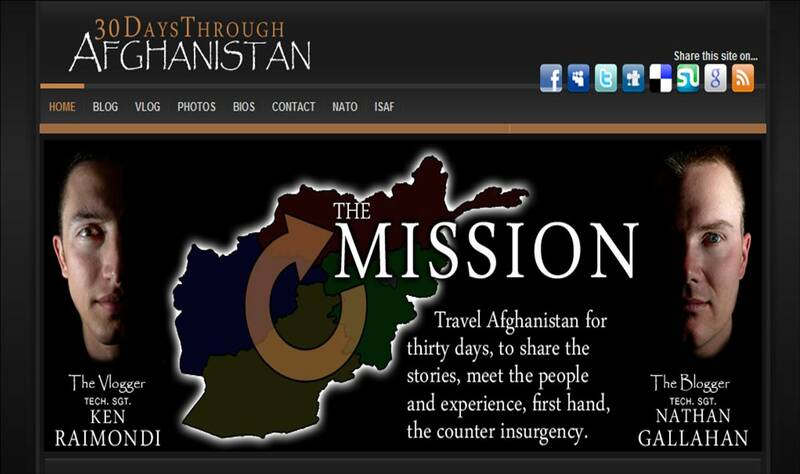 I do wonder what sort of access they will have to Afghan voices on their hectic 30 day tour but fair play to them for going in with the intention of covering more than merely the military side of the story. It’s a NATO project though so don’t expect anything from too far ‘out of left field’. Indeed, I’d be very surprised if they manage to access the sort of material you see in this recent post on the blog of photographer, Holly Pickett. (Warning: contains disturbing images from inside Mirwais Hospital in Kandahar). It almost goes without saying these days that you can catch Raimondi and Gallahan on Twitter as well.